Why hello! Spring has sprung, and I am soaking it in. Actually, I am writing this post on my back porch watching the butterflies and listening to the birds sing. What a long crazy winter we have had here in Texas. Being cooped up inside all the time with a 3 year old and a 10 month old was getting pretty old. 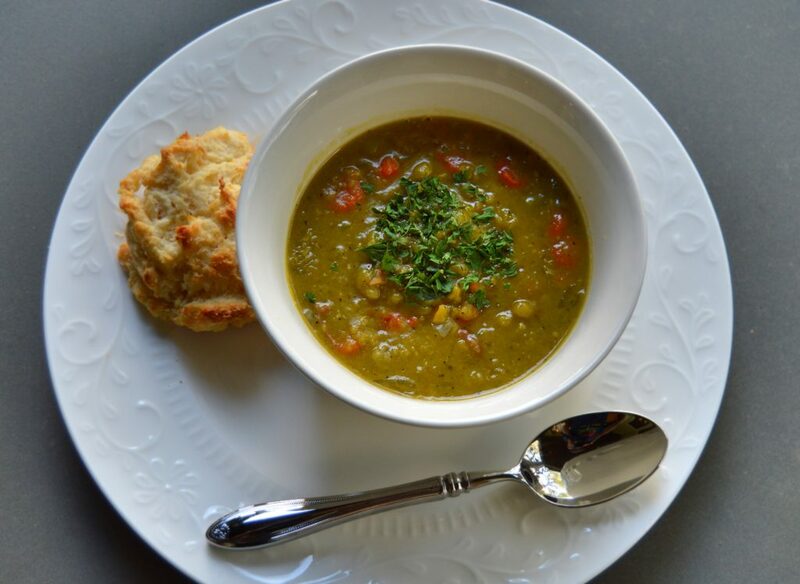 I love all this green and sunshine after all the gray and cold, which inspired me to share something green and delicious to celebrate spring – Split Pea Soup! Now to some, split pea soup doesn’t sound that thrilling, I get it. It is definitely difficult to photograph to avoid it looking like just green mush (food photography is tricky). To be honest, my husband wasn’t too excited when I told him I was making it for dinner for St. Patrick’s Day (hey, it’s green). But, I am proud to say he was pleasantly surprised, because it was indeed delicious. 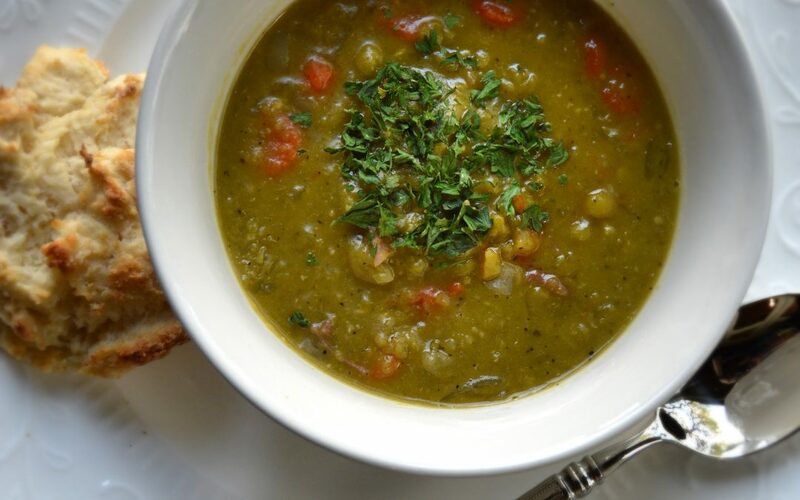 Split pea soup is an amazing source of fiber (about 20 grams per 1 1/2 cup of soup when the daily recommended intake is about 25-30 grams daily). Split peas are also not a bad source of vegetarian protein, about 8 grams per 1/2 cup. You also got the added benefits of potassium and folate. So it’s pretty darn nutritious, and despite maybe some husband/children prejudices, very tasty. And although the weather has been nicer, we are still getting a lot of gray and rainy days. A comforting bowl of soup just makes everything better. I added ham hocks to this recipe because peas and ham are oh so good, but you can definitely leave out for a vegetarian option. This is easy to whip up in the slow cooker or stove top. I personally always tend to turn to the slow cooker because I can throw it all in in the morning and forget about it until supper time. It’s just nice to avoid that pre-dinner time panic when you got 2 littles. My 3 year old did assist me in whipping up some quick homemade biscuits to go with, and man did that hit the spot. Celebrate Spring with some green soup! Oh..and I realized you can see me in the spoon. Haha! Combine peas, ham hocks, vegetables and seasonings in slow cooker. Pour broth and water over top. When done, remove ham hocks and chop up meat off of bones. Add back in and discard bay leaf. Serve with warm homemade biscuits for a real treat. Combine peas, ham hocks, seasonings, water, and broth in a large saucepan or stock pot. Bring soup to boiling, reduce heat and let simmer for 1 hour, covered. Stir occasionally. Remove pork hocks and chop up meat off of bones. Add back in with carrots, celery, and onion. Return to boiling, then reduce heat and allow to simmer for another 20-30 minutes when vegetables become tender. Discard bay leaf and serve. Still amazing with warm biscuits. This actually made for some great leftovers too the next day, but I did need to add a little more chicken broth when reheating. Those peas get thick overnight. It’s been awhile since I’ve gotten to post, but have had another new recorded webinar released since then: Nutrition for Gestational Diabetes. Being diagnosed with gestational diabetes always leads to the number one question – what should I eat? This 45 minute webinar can equip an expecting mama with everything she needs to know to help maintain a healthy pregnancy. I hope you are enjoying this gorgeous weather as we are, and enjoy this soup too! What is one of your favorite spring-time recipes? Would love for you to share! split pea is one of my all time favorite soups! It’s just so comforting! Sounds delish, I love all soups! Great use of spices in this recipe – looks lovely! What a comforting soup! I could definitely go for a big bowl right now. Sounds super satisfying! Mmm…I love split pea soup, but rarely make it. This sounds so delicious~perfect for the gloomy weather we are having here in San Diego right now.